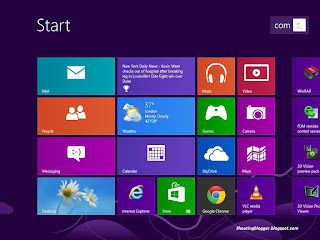 Window 8 comes with inbuilt Apps like Game's apps ,Weather apps , Calender Apps ,Store Apps ,Map Apps etc even you can Download Free as well as Paid Apps for window 8 using Windows Store Apps . All the window 8 Apps are almost cool but do you know whenever you open any apps in Window 8 it continue to Open and Share useful memory till you Properly close Apps. Closing Apps in window 8 is like headache because of Start screen design . Actually Start screen have an option to close all the open Apps but due to Start screen design and background Theme ,Apps Management buttons appear as hazy and hard to Detect it . Apps Management buttons contains the list of open apps that's why Apps Management buttons will appear only when any Apps is Running in background . In case You don't spot Apps Management buttons in the start screen that means No Apps is running in background . Step 2 : To open Start Screen , Point your mouse pointer at Extreme Top Left corner or Extreme Bottom Left corner Of the desktop . Note : Click on Start Screen , if you can't find Apps Management buttons (A small Vertical strip at Left Side of start screen ) , then you don't have any apps running in background . Step 3 : Click on Start Screen , Move your mouse pointer along the edges (Left ) of the Start-screen to Apps Management buttons , It does Opens the list of open Apps . Step 4 : Now right Click on Apps you want to Close and click on Close . Closing Apps force fully will not Ruin you apps , Its just Alternative way to close any open program or Any open apps from Single location . By Closing Apps force fully all of your unsaved work will be lost without any Window prompt . Step 2 : Click on Task manager and then Click on Process tab .